We Proudly Present Our 2014 Grant Recipients! The Vashon Wilderness Program (VWP) began in 2007 with the desire to cultivate relationships between self, community and the natural world. Scholarships were immediately offered to all interested youth, ages 4-17, so that no child would be excluded. VWP’s programs highlight nature as our teacher. Their research shows that teaching children in nature about nature is crucial to developing the whole child. Children grow inwardly, recognizing their own value as they learn to appreciate and study the great outdoors. Read more about Vashon Wilderness Program. The Kelly Ann Brown Foundation (KABF) is excited to partner with educator and friend Mike Helstad to assist with his classroom at Global Connections High School in SeaTac, Washington. Global Connections is a public school located in a high poverty area south of Seattle. Mr. Helstad teaches a class of eight students in the Emotional Behavior Center (EBC) at Global Connections. EBC is a new program geared to work with students who, due to past trauma or mental health issues, have difficulty learning in a traditional classroom setting. Read more about Global Connections. The Crucible promotes creative expression, reuse of materials and innovative design while serving as an accessible arts venue for the general public. The Crucible works to break down barriers for those who perceive the industrial arts as inaccessible. It fosters a sense of belonging for its students and community members and helps them to create rich connections and to support one another through the process of creative development. Read more about The Crucible, and why we are thrilled to include them as a 2014 Grant Recipient. “We are a SOCIETY of experts who respectfully partner with families. We advocate for the health, safety and PROTECTION of children. We CARE about healing and strengthening relationships within the family. We empower parents to support their CHILDREN. Healing the past, nurturing the future. We are SPCC." The story of SPCC began in New York City in 1875 with the plight of the small child Mary Ellen. Neighbors of Mary Ellen’s adopted family suspected she was being abused and joined forces to identify an organization to help her. To their amazement they found none. Undaunted, they continued their efforts and eventually gained an audience with Mr. Henry Bergh, the founder of the first Society for The Prevention of Cruelty to Animals (SPCA). He agreed to help Mary Ellen and in so doing, the first child protection case in our nation’s history began. Whenever we have organizations whose mission includes serving children in need, we immediately smile and think of Kelly. Last year our 2013 grant to UMO helped bring 1,200 underserved South Seattle public school kids to view and participate in Seattle’s ACT Theater. This year UMO plans to use the 2014 Kelly grant to serve Vashon Island children (an island between Tacoma and Seattle in the Puget Sound) through UMO Ensemble’s School of Physical Arts, now in its seventh year. Read more about UMO Ensemble. 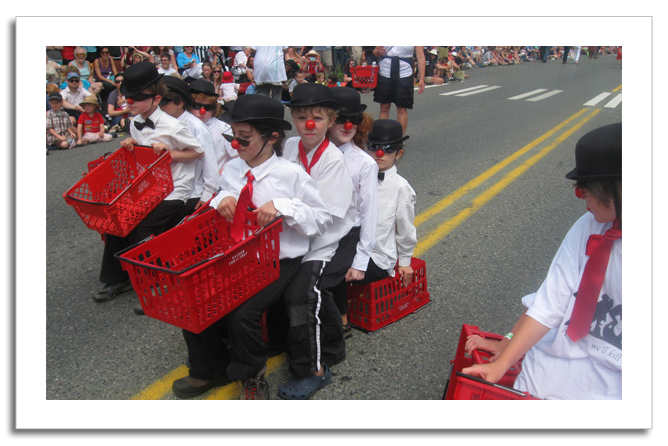 UMO Clown Boys in the annual Vashon Island Strawberry Festival Parade. The Kelly Ann Brown Foundation board met in San Francisco the week of October 13, 2014—we chose that date deliberately. 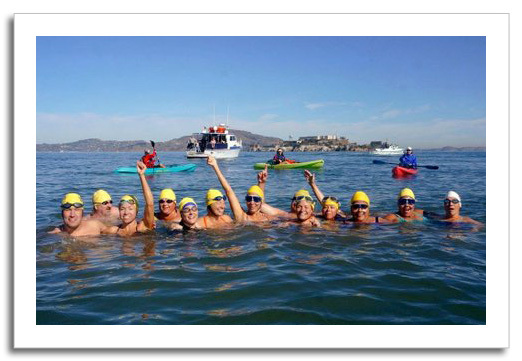 It is Indigenous People’s Day and the date of the 12th annual Pathstar swim. As a board, we were honored to volunteer and assist in the kitchen for the celebratory meal following the swim and to be there on the dock to cheer on this year’s swimmers. Awards were given and we were surprised to receive one of the two Pathstar Starfish Awards! Read more about Pathstar and why KABF is once again honored to include them as a grant recipient. I think that any single act that you do potentially could change the world. KABF recently learned from Leslie Schuld, the executive director of CIS, that the scholarship money that KABF provided in 2013 and 2014 has been used to support the high school education of two women. Carmen Elena is married and has three children. Sonia is a single mom with four young boys. Both women are regarded as leaders on Tasajera Island in La Paz, El Salvador. They are trained seamstresses, certified in sewing machine repair, and now, thanks to KABF they are also high school students! We are so proud of them! Carmen Elena and Sonia, Kelly Ann Brown Scholars! Nationally recognized for its work to integrate gardening, cooking, and sharing school lunch, The Edible Schoolyard helped lead to the School Lunch Initiative, a national agenda integrating gardening and nutritious lunches into the academic curriculum of public schools across the United States. 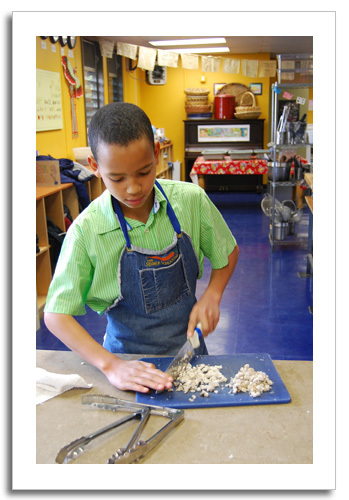 The Kelly Ann Brown Foundation is proud to be a part of The Edible Schoolyard’s mission. Read more about The Edible Schoolyard Project. Two years have passed since the Vatican in October 2012 permanently expelled Father Roy from the priesthood for his public support of women’s ordination. He had been a Roman Catholic priest for 40 years, a beloved member of the Maryknoll priest community. Dismissal is the equivalent of the death penalty as far as punishments go in the Catholic Church; it is the most extreme. Father Roy had caused the Church “grave scandal” (their words) by addressing the idea that God could also call women to the priesthood. 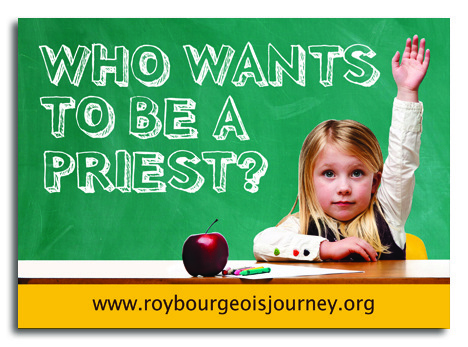 Read more about Father Roy and KABF's effort to support this great man and his work. --Martin Luther King, Jr. "Letter from Birmingham Jail"
The Louisiana-Mississippi Hospice and Palliative Care Organization supports hospice programs in six prisons, five in Louisiana and one in Mississippi. The Executive Director, Jamey Boudreaux, invited me to visit Angola and I quickly took him up on his offer. Seeing it for the first time in September, 2014, I realized that this program would be an easy fit for the Kelly Ann Brown Foundation. Kelly was always so forgiving of others in the worst of circumstances and was always compassionate. 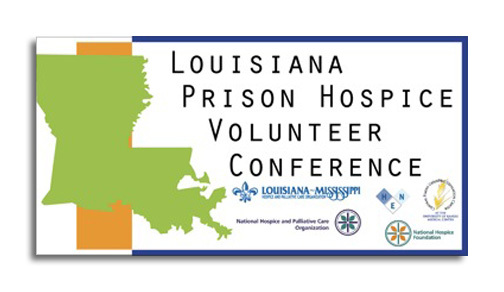 This program exemplifies compassion in the face of an unjust judicial system. While many of these men are guilty of their crimes, punishment is distributed with grave inequality in the United States. Louisiana has the strictest sentencing laws in the nation, which is why I chose to focus on the prison here. Father Bix gratefully accepted the 2014 grant from the Kelly Ann Brown Foundation. It came at a particularly difficult time. 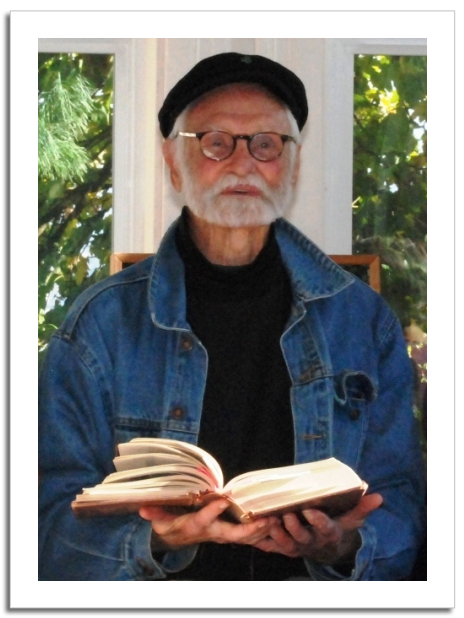 His dear friend Lynne Greenwald, a fellow peace activist and resident manager of the Irma Gary House, had just died. Bix himself had undergone four unsuccessful eye surgeries that have left him with blurred and partial vision, at best. Despite these set-backs, Bix is eager to use the grant money to return to Jeju Island. Read more about Father Bix.